Maddy Wooten is an NBA dancer who went natural because the coloring and relaxing that her NBA team had in mind for her made her hair fall out. 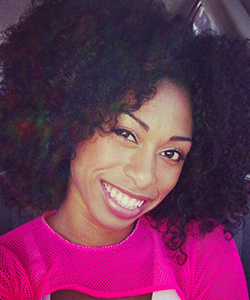 We're so glad she shared her natural hair journey with us! 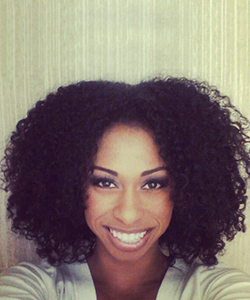 NaturallyCurly: Do you feel pressure to wear your hair relaxed or wear weaves in your industry? Maddy Wooten: If you were to ask me this question 8 years ago, my answer would have been ABSOLUTELY! Long and straight hair was popular on black women in the industry. As female dancers, “hairography” is a large part of our dancing, which often requires straight hair. 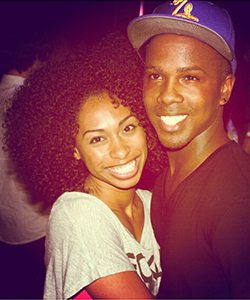 Nappy hair does not move the same way straight hair does, so flowing hair is highly desired in dance. When you look back at history, black women began straightening their hair to look less “ethnic” and blend in more with other women in America. It was an attempt to fit in with society and to be valued equally in the workforce. Each dancer in the industry has her own look. It either sets her apart for helps her represent a certain brand. On teams, each girl represents a certain demographic. In order for me to look like what I was expected to look like, I needed to straighten my hair. I auditioned two years with curly hair but needed to straighten it for my official team look. 8 years ago, the black woman was always shown with relaxed hair. Nowadays, almost every commercial or print ad shows the black woman with her natural hair. The “look” of your everyday black woman according to America has grown to include both straight and curly hair. Nowadays, I don’t feel as pressured because I know how to style my hair to compliment me. NC: What has your experience been wearing your hair natural in your industry? MW: I feel that every black woman has a different experience when embracing their natural curls. My experience has been absolutely wonderful, largely because I have mixed hair! My hair is full and curly, yet soft so it still bounces and moves when I dance. I have been able to achieve most of the movement in my hair that was always desired when I straightened my hair. I also feel that my positive experience is largely a result of America’s new perspective of the black woman. Natural hair is in. 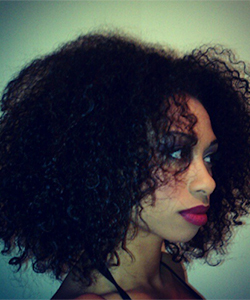 It is a worldwide movement that is empowering black women to embrace their natural curls. I have noticed that if my hair is too big or too long, it becomes to edgy for commercial work. It leaves the “all American black girl” world and crosses over into the “edgy backup dancer” world. Depending on the type of dance jobs I want to work on, this can be a good or bad thing. It is interesting because I actually auditioned for a “cheerleader” role on a VH1 Sitcom, and they only picked black girls with straight hair. I have learned that there are just some jobs that I won’t really be considered for due to my hair, yet there are also just as many jobs that desired ethnic hair. NC: What has the reaction been from other dancers? From staff? From your family? MW: The reaction has been great! Not a day goes by without somebody commenting on my hair. Dancers, staff, and family alike have all given nothing but good feedback regarding my curly hair. NC: Were you a slow transitioner or a big chopper and why? MW: I started out as a slow transitioner because I was still a Miami Heat Dancer at the time and needed to maintain the look that I started the season with. I was also a professional dancer in the Miami area and booked all my dance jobs with straight flowing hair. I then left Miami and go underground and take a break from the industry in order to change my hair. This is when I did the big chop. My natural hair was only two inches long at the time. I picked dance jobs at theme parks and cruiseships for the next two years that did not require me to straighten my hair. I actually wore wigs and headpieces for most of my work. This allowed my hair to grow out slowly over time. NC: What has been your greatest challenge transitioning? MW: My greatest challenge transitioning was accepting the fact that I would actually have to leave my job in order to go natural. I had to relocate in order to get away from the industry that needed my straight flowing hair! I also did not know what lay on the other side. NC: How does your hair affect your persona on the court? Is that different now that you're natural? MW: I am currently part of a dance team that has embraced my natural curls! 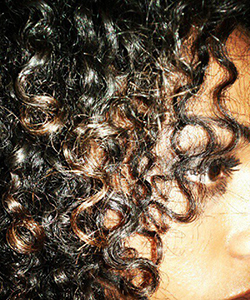 I feel that my curls match my personality because I am a happy, positive, and bubbly individual. When I perform, my persona is friendly, inviting, and outgoing. This persona is definitely different from when I had straight hair. Back then, my persona was more on the flirtatious and seductive side. NC: Have you inspired any of your fellow dancers to go natural? MW: I feel that I may have inspired dancers, non-dancers, and even family members to go natural. According to my husband, when we first visited LA and took dances classes, I was the only black girl with curly hair that he saw. After I got off of my cruiseship and officially moved to LA, he saw a few more dancers who used to have straight hair and then went natural. I was one of the few working dancers with natural hair, and now over a year later there are dozens of working dancers who have all gone natural. Several of my friends from high school also went natural after witnessing my journey. NC: What's your current hair routine? MW: I like to wash and condition my hair twice a week on average. How much I sweat in my hair or how much product for stage that I use in my hair are strong variables in determining when I wash. Due to some of the product that I put in my hair, I like to use a deep conditioner every time I wash instead of once a week. NC: What do you do to maintain your hair at night? MW: I protect my hair a night in a modified pineapple wrap. First I perform the typical pineapple wrap, and then I hold out the very corner triangle piece and tuck in all of the ends of my hair. I then pull the triangle forward to the front of my head and tuck it into the rest of the pineapple wrap. This ensures that 100% of my hair is covered. NC: What do you love the most about your hair? MW: My natural hair compliments me and my personality way more than my relaxed hair did! I absolutely love what my hair says about me! I want to be able to inspire other women across the globe to feel the same way about themselves. Going natural provides a sense of self. A sense of accomplishment. A sense of perseverance. It has a magical power that can't be match. A confidence that can't be moved. It is empowering. It is liberating. It is all that it seems to be and more. NC: What advice can you extend to some of the natural newbies? MW: I would tell natural newbies to be patient and that they should not compare themselves to other girls. Mixed hair comes in many variations in texture, and everyone’s hair has its own growth rate and maximum growth length. I would also say to trial different natural hair products. What works for me might not work for you. I tried 6 shampoo product and 10 styling products before settling down with my top 2 of each. NC: What are you working on now? MW: I just wrapped up my fourth season dancing in the NBA and recently opened my own dance studio with my husband, Movement Inc. Dance Center in Santa Clarita, CA. 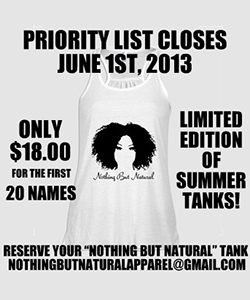 I am very excited about this summer because I am also officially releasing a limited edition of my new "Nothing But Natural" racerback tank top! I am currently accepting reservations at this time because once this item sells out, it will be discontinued. Anyone interested can email me at [email protected]gmail.com by June 1st, 2013. NC: How can our readers find you on the web? MW: My personal website is www.MaddyWooten.com. I also have a Facebook Pages “Maddy Wooten” and "Nothing But Natural". I can be found on Twitter (@MissMaddyMad and @NothinBTNatural) and Instagram (@MissMaddyMad and @NothingButNatural).